Over the past year, I've gone all-in with iOS. Following years of experiments, struggles to switch from a Mac-centric workflow, and encouraging signs of maturity from the platform, I chose to make the iPad my primary computer. I used the iPad Air 2 more than any other iOS device before, and the iPad Pro is filling that role now with great success. After being convinced to give the iPhone 6 Plus a try by a good friend, I realized that a bigger phone was better for my needs, which resulted in an instant 6s Plus purchase a few months ago. The iPhone isn't only my pocket computer and Twitter machine – it's my music, my camera (which I used to shoot this video), my portable gaming device, and my stream of living memories thanks to Live Photos. At this point, I'm only using my MacBook three hours a week to record two podcasts on Skype. Effectively, all my computing – work or entertainment-related – is done on iOS, and I treat my iPhone and iPad with the same care and respect that others would treat their Retina iMacs and Mac Pros. The iPad Pro in particular is the computer that enables me to write and pay the bills. It's not just a nice thing to have – it's the tool upon which my livelihood hinges. It's not surprising, then, that I'm just as scrupulous when it comes to the apps I choose to get work done. While part of my job is about discovering new apps, such effort isn't mandated by a shallow pursuit of "new" without merit. I'm constantly on the lookout for tools that can make me faster, produce better content in less time, and approach what I do in different ways. It's a functional curiosity, not a shtick. The virtuous cycle of finding new apps, trying them, and documenting what trickles down to my daily workflow is at the very foundation of MacStories. At the end of the year, I always like to take a couple of weeks to look back on the past 12 months and assess the state of my favorite apps. I've been doing this in various forms for five years now, but I've kept the same criteria in mind: which apps truly help me work from my iPhone and iPad? What are the tools that let me enjoy my devices for personal and professional use as much as possible? With the increased importance of iOS 9 and the iPad Pro in my life this year and given some growing trends on the App Store, I thought I'd shake things up a little. Instead of having two separate articles for my must-have iPhone and iPad apps, I combined my 50 picks in a single list and organized them in eight categories. I believe this makes sense given that only 7 apps out of 50 are not Universal downloads from the App Store. 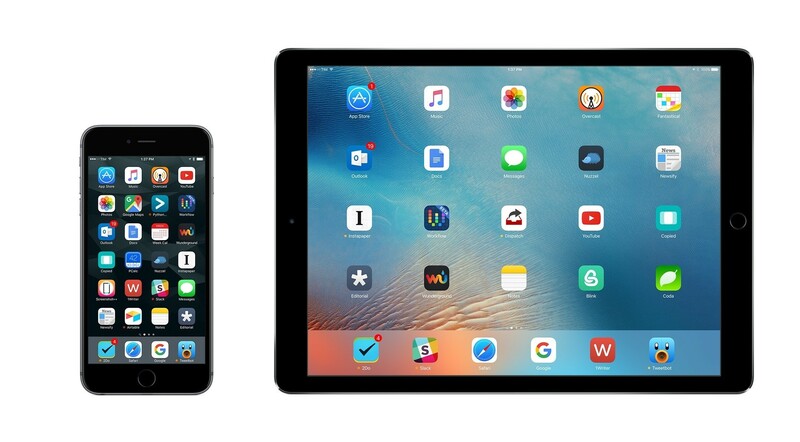 The vast majority of my favorite apps are available on both the iPhone and iPad and I use them on both platforms; it's more logical to consider them as single entities. Below, you'll find my Must-Have iOS Apps for 2015 – the ones that have been essential for my workflow over the past 12 months. At the end of the list, you'll also find my App of the Year and two Runners-Up. 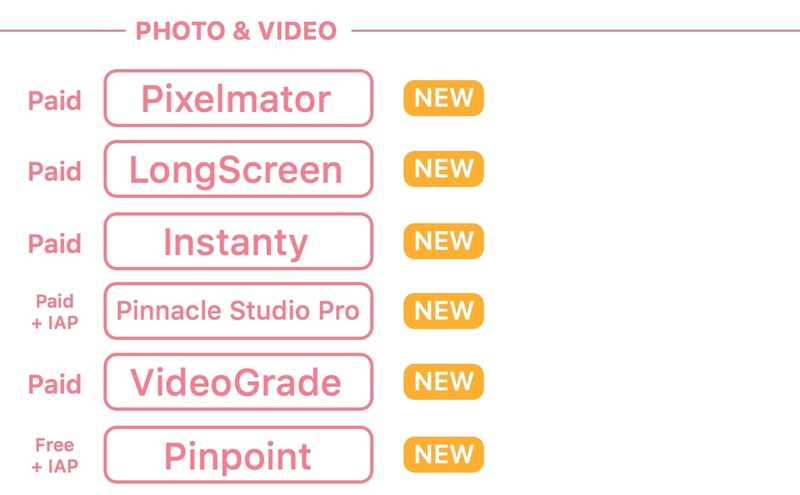 Each app has been listed with a direct link to its App Store page; wherever possible, I included links to previous MacStories coverage as well. 2Do. A true revelation this year, Fahad Gilani's 2Do for iPhone and iPad has actually been around since 2009 and has gone through dozens of updates. However, it only was this summer that 2Do piqued my interest, and what I discovered was, by far, the most powerful and customizable task manager I've ever used on iOS. Copied. I started using Copied by Kevin Chang in early November, and it didn't take me long to realize it would become my favorite clipboard manager. 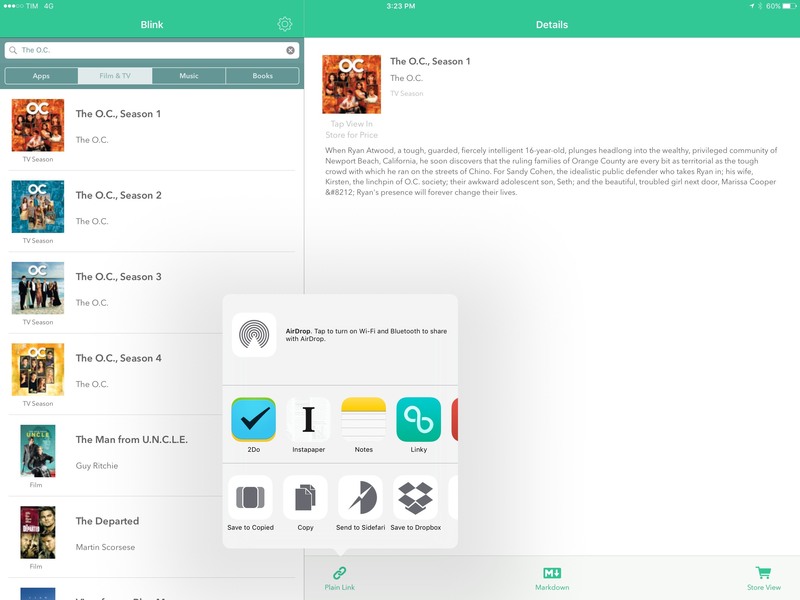 I've tried many similar apps through the years (such as Clips and Copyfeed), but Copied provides the best combination of simplicity and flexibility for what I need to store in the app and access from two devices. 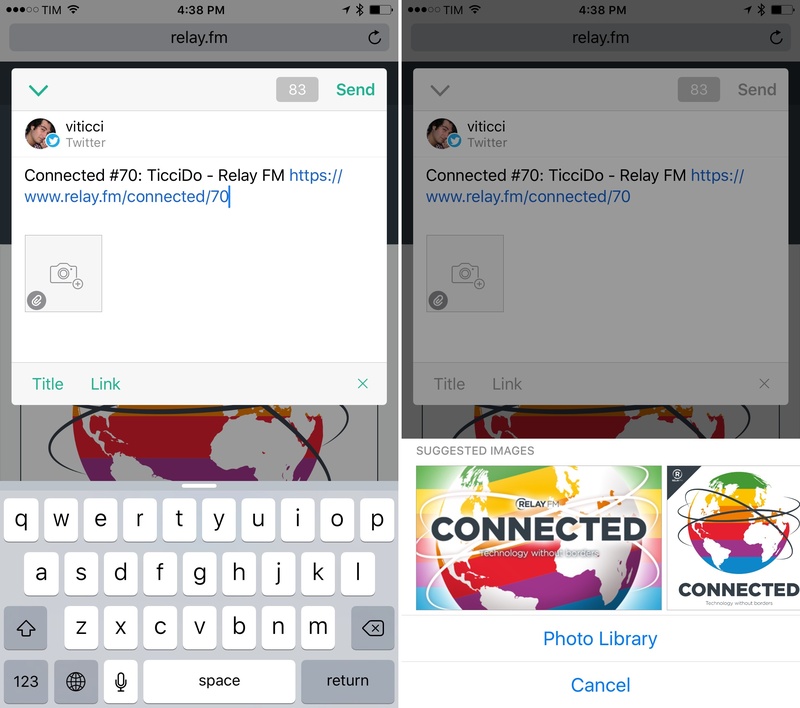 At its core, Copied holds bits of text and images, syncing them with iCloud across iOS and OS X. Its iCloud sync is the fastest I've seen in any similar app, and it can even push clipboard items directly to other devices with actionable notifications. Slack. 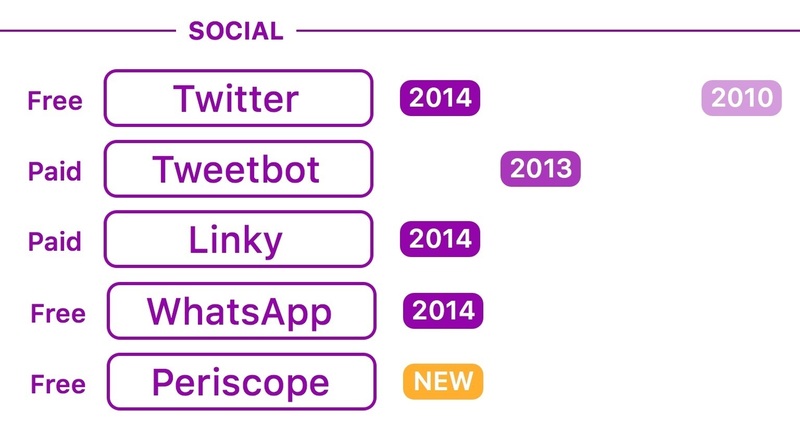 2015 has been the year of Slack for the MacStories team. After trying several services since 2010 (from group iMessage conversations to HipChat and GroupMe), we've found what we were looking for in Slack thanks to its excellent integrations, open APIs, solid mobile apps, and deep customizations. We pay for Slack because our communications, status alerts, and even news aggregation feeds are based on it. I'm using Slack with two different teams (MacStories and Relay FM), and we've created a custom command for our MacStories channels so I can easily assign tasks to myself and have them end up in 2Do. My two other highlights from Slack: I can redirect emails to it as part of our paid account, and the app takes good advantage of the iPad Pro's display. I love Slack, which is kind of strange to say for a communication service, but I can't escape this feeling. Outlook. 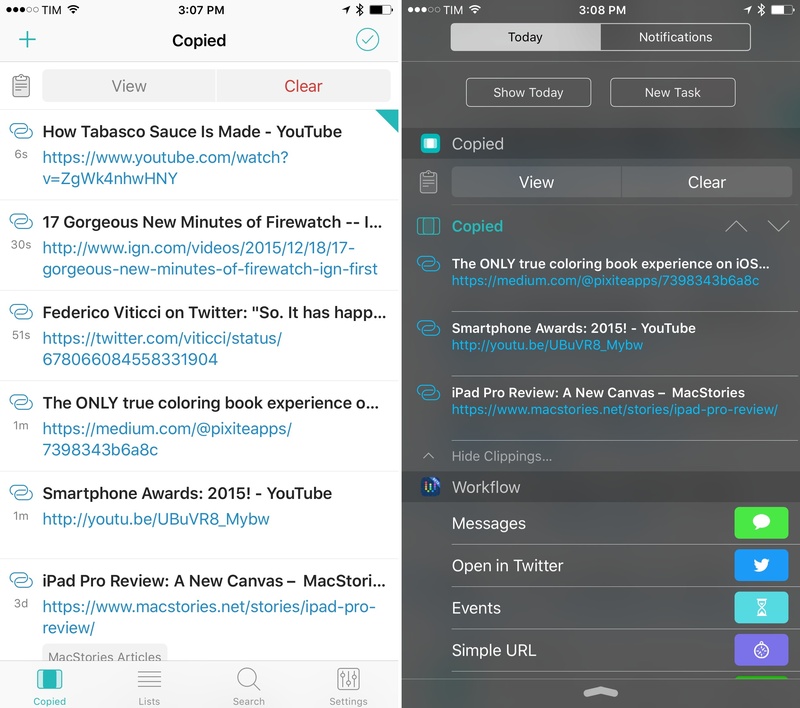 Previously known as Acompli, the email client acquired by Microsoft that later turned into Outlook has evolved into one of the most popular email apps for iPhone, iPad, and Apple Watch. Forget what you know about the legacy Outlook for desktop computers: Outlook for iOS is a modern app with support for iOS 9 multitasking and 3D Touch, integration with email providers like Gmail and iCloud, an extension to send messages from apps, and push notifications. Outlook hasn't completely abandoned its nature of email/calendar hybrid, though: the app launched with a basic calendar built-in, but Microsoft is promising deeper support for calendar features thanks to Sunrise, also acquired by the company. I use Outlook because it's fast, reliable, and polished. Threads are nicely formatted and they load quickly. Search for my Google Apps account that goes back to 2009 returns results in a few seconds. Attaching files to messages is a breeze, too, as the app integrates with Dropbox and Google Drive to view your files and send them as inline attachments or links. Initially, it felt strange to say that Microsoft was making the best email client for iOS right now, but that's absolutely the case. I'm very happy with Outlook. Dropbox. I don't know where I would be without Dropbox. For the past five years, the service has been my filesystem in the cloud, offering a simple way to sync files with drag & drop in the Finder (back when I used to work on multiple Macs) and native integrations with iOS apps to let them sync their documents and libraries anywhere. Today, the Dropbox app isn't great – it still lacks iOS 9 multitasking support on iPad, for example – but it's got decent options to create shareable links and manage folders, and, plus, it's my only choice if I want full control over my Dropbox on iOS. 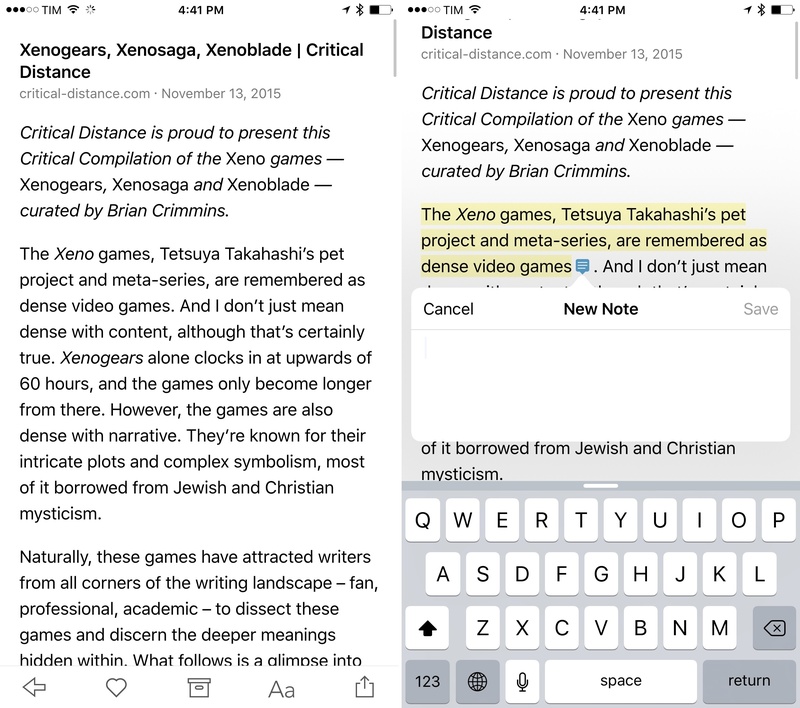 Dropbox is the engine behind 1Writer, 2Do, 1Password, and many other apps; I'd just like to see the iOS client get more love. Google Docs. Another case of an app that doesn't get a lot of attention when it comes to supporting the latest iOS advancements but that, despite its shortcomings, remains my only option. Everyone at Relay FM uses Google Docs because we're deeply entrenched in the Google Apps ecosystem, so we can't move away to embrace solutions like Quip or the upcoming Dropbox Paper. Google Docs is the tool we use to prepare all our shows before recording: document outlines, show notes, listener questions – everything is stored in a collaborative Google document where multiple users can type simultaneously and watch edits in real time. Google Docs was updated this year with better formatting controls that are easier to access (indenting and outdenting text is no longer a nightmare), but the app is being held back by the lack of iPad multitasking on iOS 9. Blink. John Voorhees' app is a must-have if you work with affiliate links for the iTunes Store. Blink allows you to easily generate affiliate links so that every time someone buys something from the iTunes Store using your link, you'll earn a commission. Instead of having to generate those links manually, Blink has a menu to configure multiple tokens and campaign tracking codes, which will be appended to the link once you've found an item from the integrated search feature. You can also run Blink as an extension in the iTunes Store and App Store apps on your device if you come across media that you want to share with an affiliate link. Tweetbot. 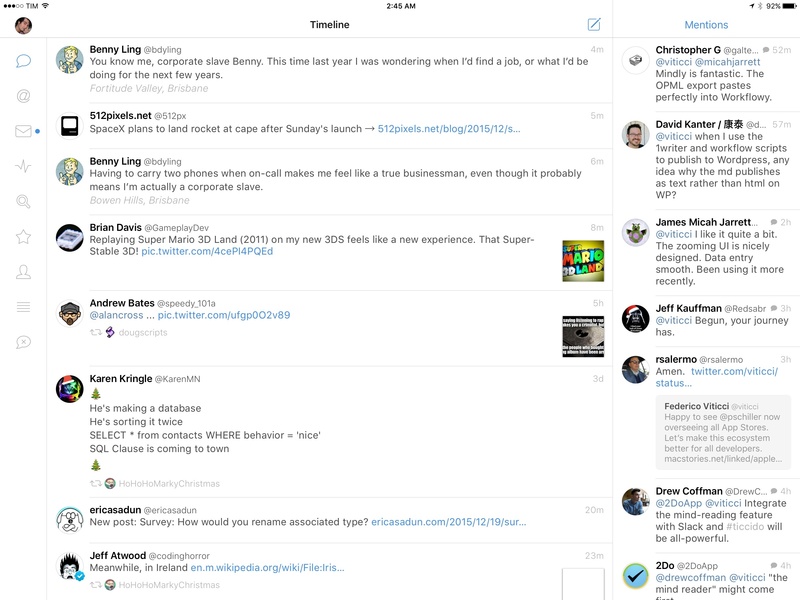 Tapbots' Twitter client has made a grand comeback to iOS this year, with a major 4.0 release that, among numerous improvements on the iPhone, included a brand new iPad app with a modern design and a two-column layout. As a result of Twitter's baffling take on iPad app design and the quality of Tapbots' latest creation, I moved back to Tweetbot as my main client. Periscope. I'm much more happy with Twitter's live streaming breakout hit, Periscope. I don't do live streams often, but when I do, I'm usually having a good time and I don't feel the anxiety of a permanent online video archive because streams are automatically deleted after 24 hours. I put Periscope on my iPhone because I've found myself in scenarios where I was glad I could live stream without the pressure of a "real" video; of course, I also need the app to watch other people's live videos. I think the Periscope team is doing a great job keeping the app lean and versatile at the same time. Linky. I've been using Linky every day since it relaunched with iOS 8 in 2014, and it's a breath of fresh air if you've never liked the share sheets offered by Twitter and Facebook. Linky is the social share sheet for power users: you can switch between (and share from) multiple accounts, and if you want to make sure every piece of your message looks good before publishing it to your stream or page, syntax highlighting will let you confirm that usernames, links, and hashtags have all been inserted correctly. WhatsApp. Another app I'm not happily choosing, but which I'm forced to use because all my friends and their friends are using it and don't want to switch to something else. As I've said before, I would gladly use Telegram in lieu of WhatsApp: Telegram is also free, it has an iPad app, and it's traditionally been faster at supporting new iOS features with updates. Alas, my friends – people I know in real life who don't read articles like this one – don't care about a technically superior product. They just know WhatsApp. And so I also use WhatsApp, which is fine, but could be so much better with an iPad counterpart and faster rollouts of new iOS features (for instance, the app only got support for iOS 8 interactive notifications a few months ago). To WhatsApp's credit, they added a handy preview system for URLs which is far better than Apple's link sharing on Messages, and they allow you to backup your chats (including media) to iCloud manually. I don't love WhatsApp, and I continue to hope they'll consider an iPad version someday. Newsify. I've tried a handful of RSS services and clients for the past year – most notably, sticking with NewsBlur for about six months – but in the end I always go back to Ben Alexander's Newsify, also included in my must-have list in 2014. My pick would probably be different if I worked all day from a desktop web browser, but, for me, the iOS version of an RSS client is the most important part, and I find Newsify to be better app for the iPhone and iPad. A lot of features in Newsify click with the way I like to sift through RSS. The app works with Feedly, its sync is fast, and I can find old articles with full text search. 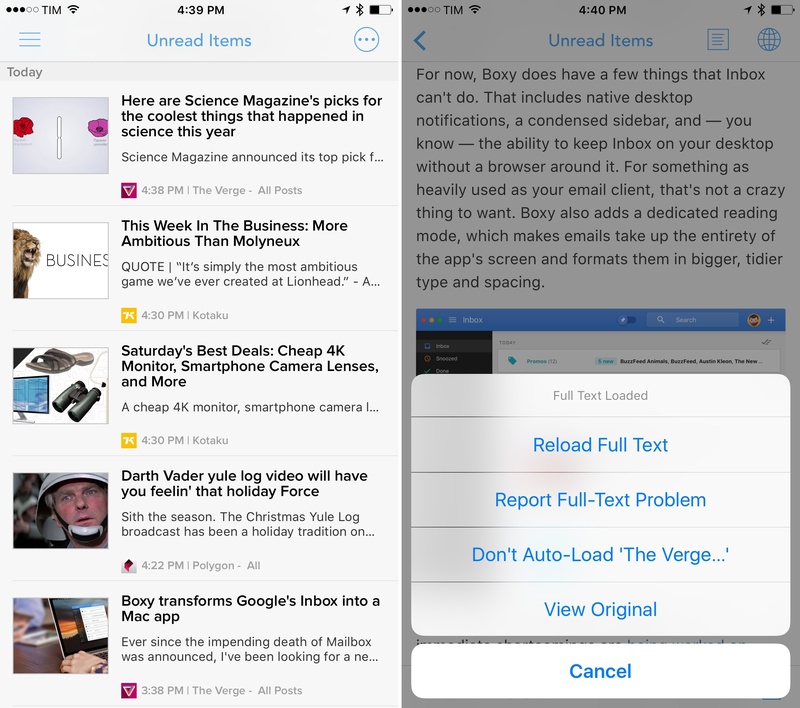 Newsify was quick to adopt iOS 9 multitasking and Safari View Controller's Reader mode; links can be shared with system extensions and there are a lot of options to customize everything about the app's look and behavior. I especially like the ability to preview articles while scrolling with peek and pop, and I've subscribed to the annual Premium plan, which loads full text for all my feeds without having to open a web view. Even better – full text view can be set on a per-site basis, so I can whitelist blogs that share a lot of linked items (such as Daring Fireball and Pixel Envy) to make sure I see their RSS view instead of the linked website's. Newsify is fast, customizable, and it makes going through hundreds of feeds every day a pleasure. I'm curious to see how it'll evolve alongside Feedly in the next few months. Instapaper. In the past year, betaworks has continued to iterate on Instapaper, bringing major additions for people who spend a lot of time in the app, like yours truly. Sleep++. Underscore David Smith has done it again: with Sleep++, he has turned a simple idea into an essential app with no equal on the App Store. Sleep++ lets you use your Apple Watch as a sleep tracker: charge the device before bed, then, when going to sleep, start the app and switch to Airplane Mode. 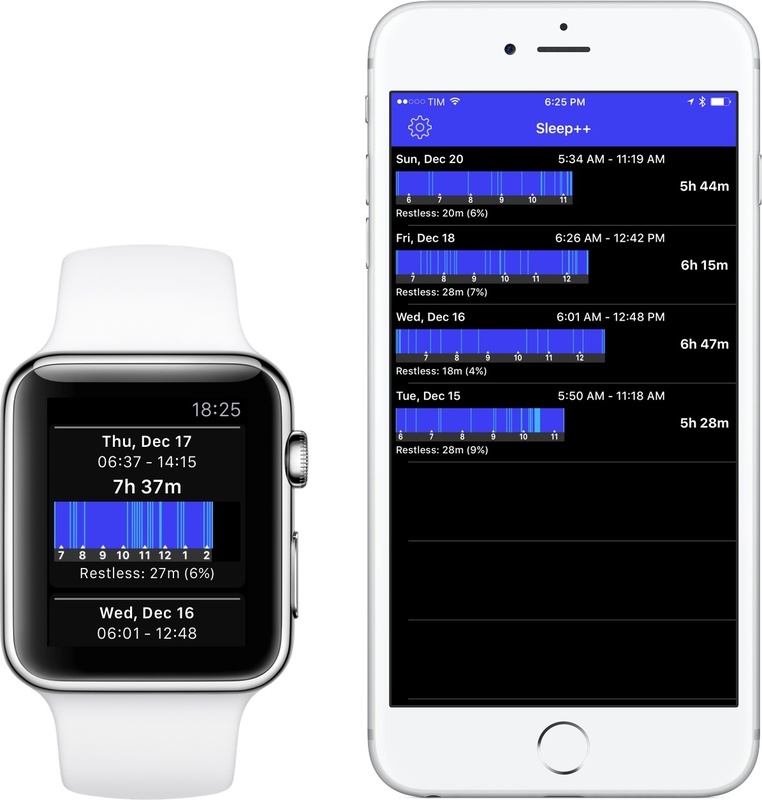 In the morning, you'll wake up with about 90% of battery left and your sleep tracked by the app and saved to HealthKit on the iPhone as well. Sleep++ uses sensors to monitor your movements and attempt to guess restless and deep sleep; because it's on your wrist, it doesn't require you to put an iPhone under your pillow to track your sleep. Sleep++ is now my favorite sleep tracker because of its simplicity, and I'm experimenting with HeartWatch integration to combine it with waking heart rate monitoring as well. Pedometer++. I have to thank Smith for his other fitness app, too. 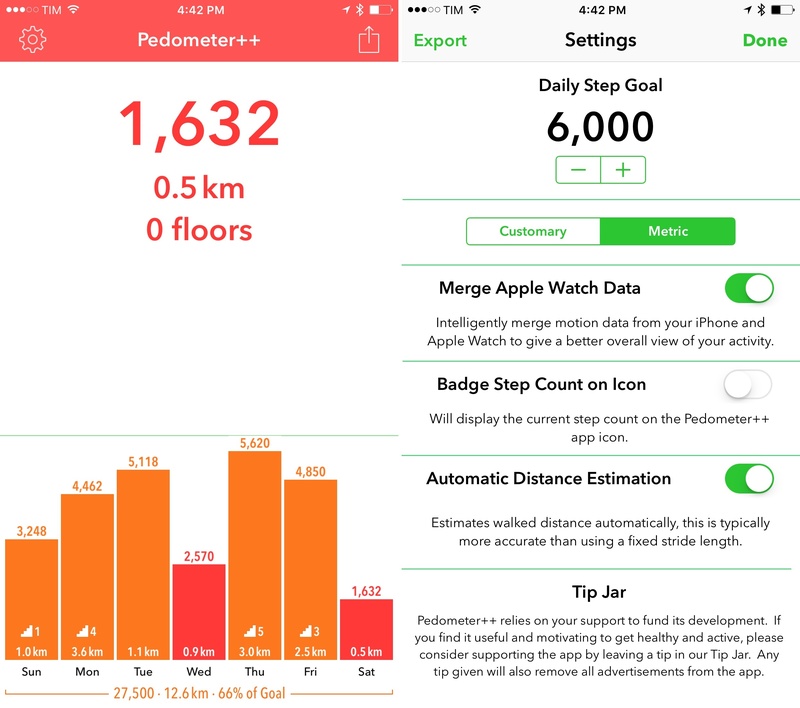 This year, Pedometer++ received a major update with a key feature for step counting: a way to intelligently merge steps counted by the iPhone and Apple Watch. Apple's own Health app merges step data based on the idea of a priority device: as long as data is available – even if your iPhone has registered 20 steps but the Watch counted 200 – Health will always use the prioritized device it finds in the HealthKit records. Withings Health Mate. As the owner of a Smart Body Analyzer, Withings' Health Mate dashboard enables me to keep track of weight loss progress and it keeps me in check, reminding me that I should eat better and exercise more. There's nothing inherently spectacular about Health Mate, but it works well and it gets the job done, supporting multiple users in a household as well. Philips Hue. Building a connected home has been one of my side projects for the past year, and I started from an obvious place: Philips Hue lights. Since buying a starter kit less than a year ago, the ability to turn my lights on and off has grown on me, and I've developed a habit of setting lights to specific colors to match my mood or relax with deeper, warmer colors. A few weeks ago, I upgraded my Hue bridge to the new HomeKit-enabled version that allows me to control lights with Siri. This has been a pretty great experience in my tests, but I'm still using the Hue app every day for remote access (so I can turn on my lights when I'm not home) and, more importantly, the widget. The Hue widget is, without a doubt, the most used one on my iPhone: I assigned shortcuts for specific lights (with custom photos) so I can toggle them quickly from the Lock screen, and I also have an 'All Off' shortcut I use every night before bed. There are several Hue apps with better designs out there, but the default one is consistently reliable. Elgato Eve. The other aspect of my home that I wanted to automate and monitor was building a log of temperature and humidity. We have a problematic room in our apartment where humidity is too high, and we need to be able to check on its rate multiple times a day to decide if we need to turn on the dehumidifier or not. 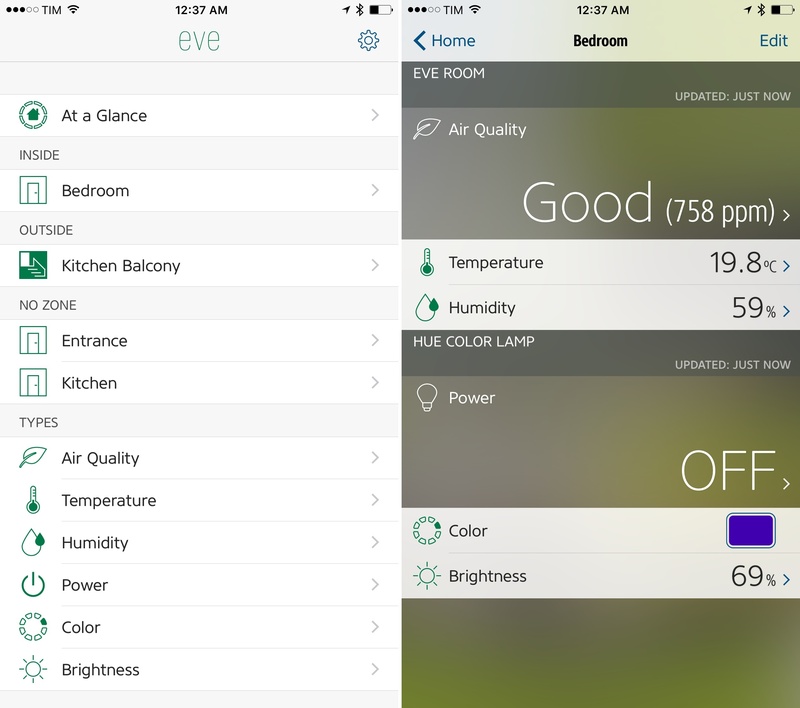 I bought two Elgato HomeKit sensors for indoor and outdoor monitoring – the Eve Weather and Eve Room. To read data from them, I use Elgato's Eve app: I don't have to use this app because HomeKit data is exposed to every compatible app on iOS (and Siri, too), but I like the dashboard approach of Eve. The app organizes home data with categories for devices, zones, and types of data monitored; in our case, we can check on our 'Bedroom' HomeKit room and look at humidity status and changes over time. In addition to reporting from its own sensors, Eve can also read HomeKit-compatible Hue lights assigned to rooms, so I can turn on my lights and change their color from Eve without launching the Hue app. Manything. A couple of months ago, our Withings Home camera became unresponsive and we needed a new camera to monitor our apartment while we were away. Instead of buying a new dedicated accessory, I remembered the possibility of retrofitting old and unused iOS devices as connected cameras with Manything. We've been running Manything on an iPhone 4 and iPod touch, and we're happy with the results. Manything can send notifications when it detects motion, which can be configured with detection zones and motion thresholds. Manything has a small delay when watching a live stream, but it's a not a deal breaker and video/sound quality is more than decent. We haven't received any false positives with the app so far, and we've been satisfied with the service's website to watch recorded footage for up to 7 days with our subscription. If you have some old iOS devices lying around and you're into the idea of monitoring what goes on at home, I recommend giving Manything a try. Overcast. 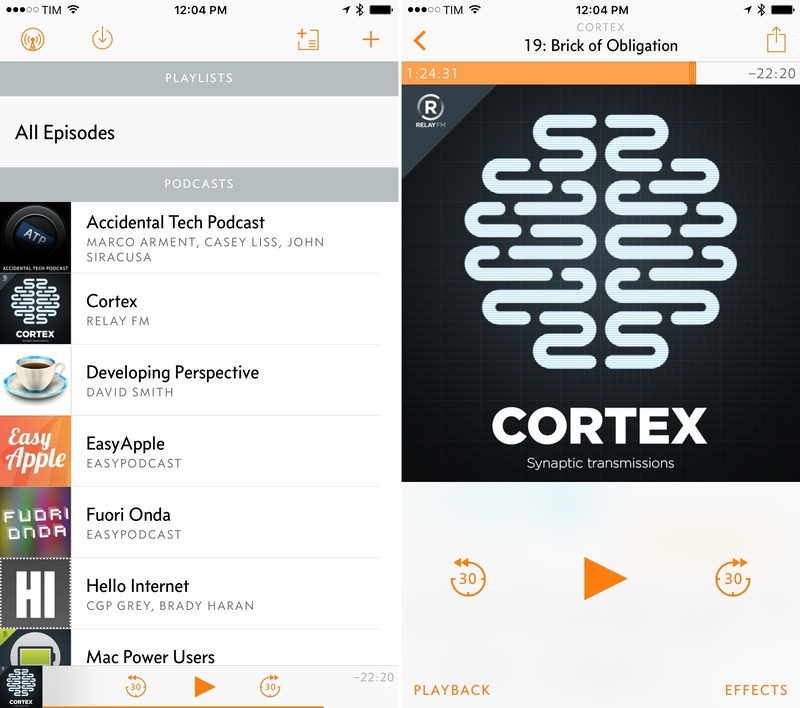 Marco Arment's podcast app has been a favorite of mine since last year thanks to one fundamental feature: Smart Speed. By eliminating bits of silence intelligently, Smart Speed allows me to save time when listening to podcasts without having to speed them up and making them sound worse. YouTube. I've tried some third-party YouTube clients in the past year (such as YouPlayer and ProTube), but I would call YouTube's official client my must-have simply for the sheer amount of native YouTube features it supports. Search results are fast and consistent with the website, I can view what's trending in a new section, and, in general, everything YouTube supports on the web tends to be available in their iOS app as well. The fact that YouTube is a bad iOS citizen with lack for multitasking and Picture in Picture support is a problem that I'd like to see the company fix soon. Shazam Encore. The leading music ID service has gotten more and more complex over the years with social recommendations and sections I don't care about. However, the core functionality remains intact: Shazam can identify popular and lesser known songs in seconds, archiving all of them for future reference. 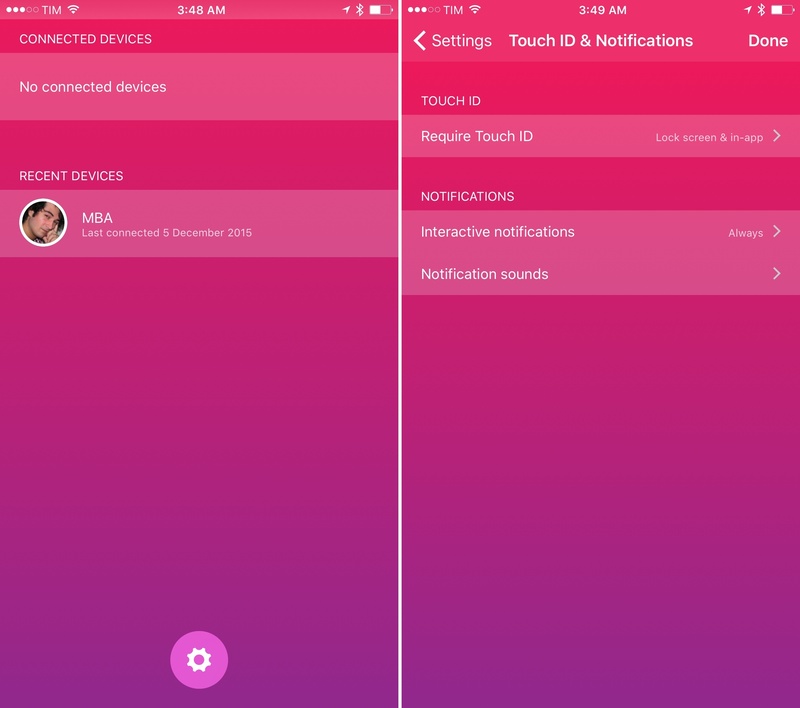 This year, I've enjoyed the ability to start listening to audio with a 3D Touch quick action from the Home screen, which has dramatically reduced the time it takes me to open the app and tap the microphone button. I keep discovering some great artists thanks to Shazam. Google Maps. Despite all the improvements and updates that Apple shipped since 2012, Apple Maps data and navigation still isn't as accurate as Google Maps for me in Rome and Viterbo. Google Maps continues to outclass Apple's service with more POIs, navigation options that make sense, timely traffic and accident alerts, and, lately, opening times for popular businesses. Documents. 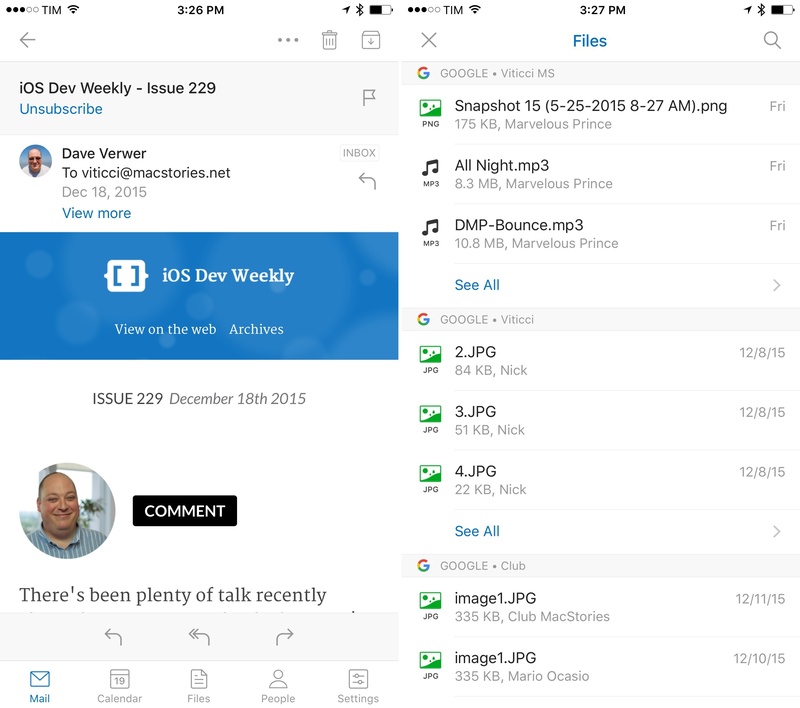 Readdle's file manager hasn't seen any major changes in the past year, but it has been updated to support iOS 9 and it always works as expected. I use Documents to transfer files from iTunes on the Mac to my iPad (useful when I need to upload a file in a rush over 4G from iOS), download files from the web with an actual downloader, unzip archives, and open files in other apps. Do Button. IFTTT's line of Do apps wants to mix the power of web automation with simple interactions on iOS. Do Button is, well, a button that you can tap to execute actions in the cloud. I have a Do Button action that I run every night to tell my girlfriend when I went to sleep (the app sends a timestamped email to her) and another to toggle my Hue lights on and off remotely. I love the idea behind Do Button. 1Blocker. I've tried several Content Blockers after iOS 9 launched but I stuck with 1Blocker because of the customization it provides. 1Blocker, like others, comes with thousands of built-in rules to block common ads, trackers, social buttons, and other junk that typically slows down the majority of webpages. What makes 1Blocker unique is the ability to create custom rules with CSS overrides to hide elements of webpages you don't like. With these rules, I have modified the way I see some of my favorite blogs by hiding sidebars and other stuff I don't care about, making the experience more enjoyable. Deliveries. I buy a lot of things from Amazon every week. 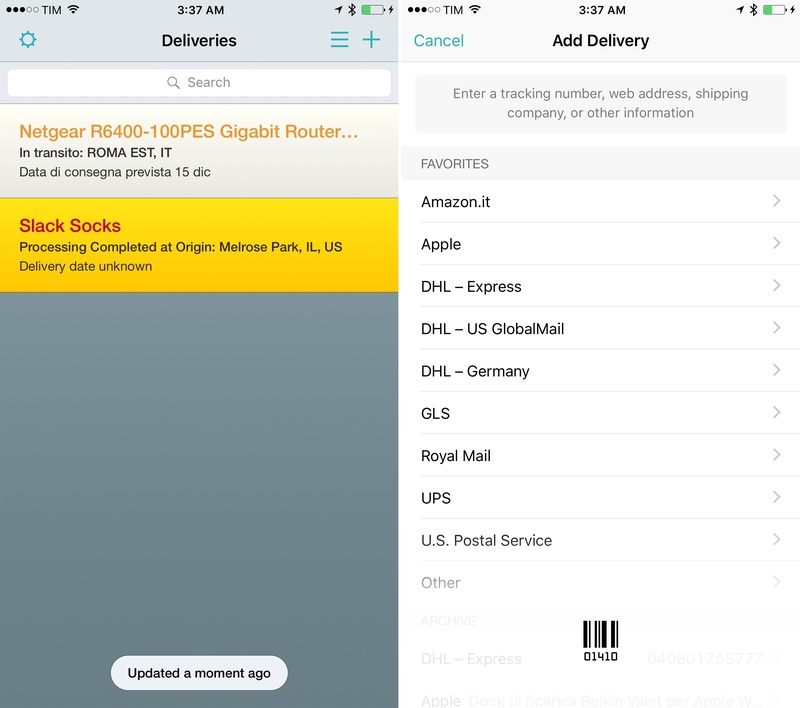 To track shipments, I use Junecloud's excellent Deliveries for iOS: the app automatically detects tracking and order numbers from popular websites like Apple and Amazon or couriers like DHL and UPS; best of all, you can copy these references in other apps like Mail and Safari, and when you open Deliveries it'll automatically find them in the clipboard. Two other nice features: logins to web services that require authentication can be done in-app with 1Password, and there's an action extension to add new tracked items directly from a webpage in Safari. Week Calendar. A few months ago, I realized I wanted a calendar app with built-in support for templates because I always create the same events and it's nice to save a bit of time when doing so. 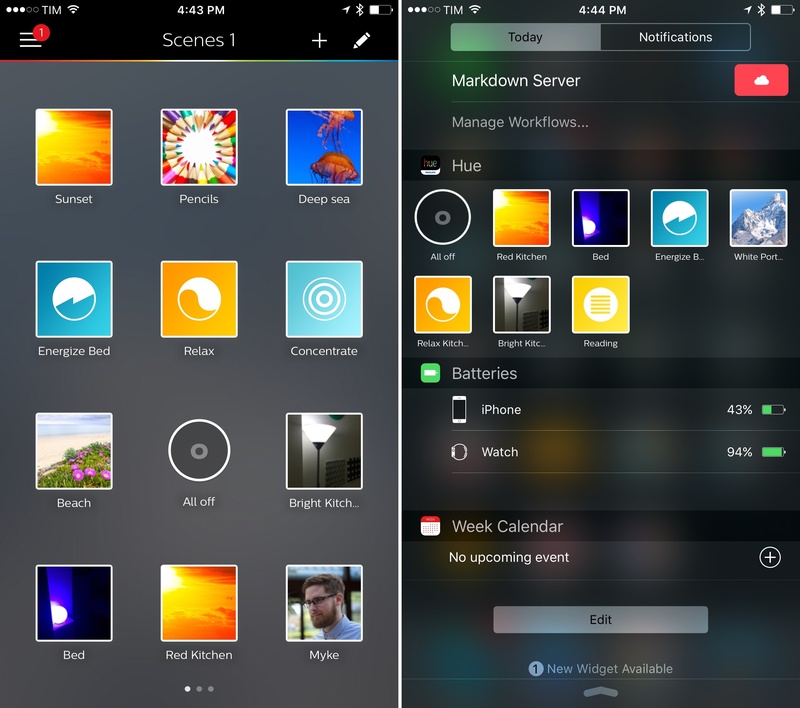 I rediscovered the power of Week Calendar (which has been around for many years): its week view is the most compact and information-dense I've seen on iOS, and there are advanced features such as event auto-coloring and icons, templates, and actions that are unmatched by other calendar clients. A detail I love about this app: if you have multiple events with locations in a row, it'll tell you beforehand how long it'll take you to get to a location starting from the event before it, allowing you to plan a trip in advance based on driving times. MacID. One of the keys in my MacBook Air's keyboard fell off last year. I'm too lazy to take it for a repair to the Genius Bar, and, because I only use my Mac twice a week, I don't want to buy a new one. This means that sometimes it's impossible for me to type my login password because the mechanism where the the key used to be doesn't work. To overcome this, I've started using MacID. Once installed, MacID lets you use Touch ID on an iOS device to log into OS X. A MacID shortcut lives in the login screen itself, and the app also works for any authentication dialog that requires password input. Even better: MacID has actionable notifications and a Watch counterpart, which means you can unlock a Mac from a notification on your wrist as well. Every time I use MacID, it feels like magic. Google. I use Google's dedicated search app for two reasons: it's the fastest way to start a Google search from the Home screen with 3D Touch and no workflows involved; and, it monitors my location in the background constantly, which I need to understand how much it takes me every week to drive back and forth between Rome and Viterbo. 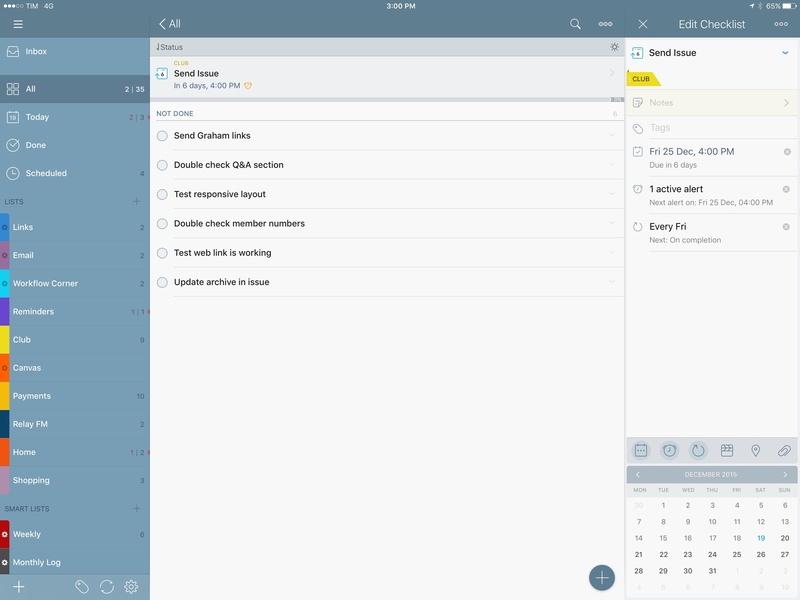 The app is also very polished and it supports iPad multitasking on iOS 9 – a welcome plus. Weather Underground. 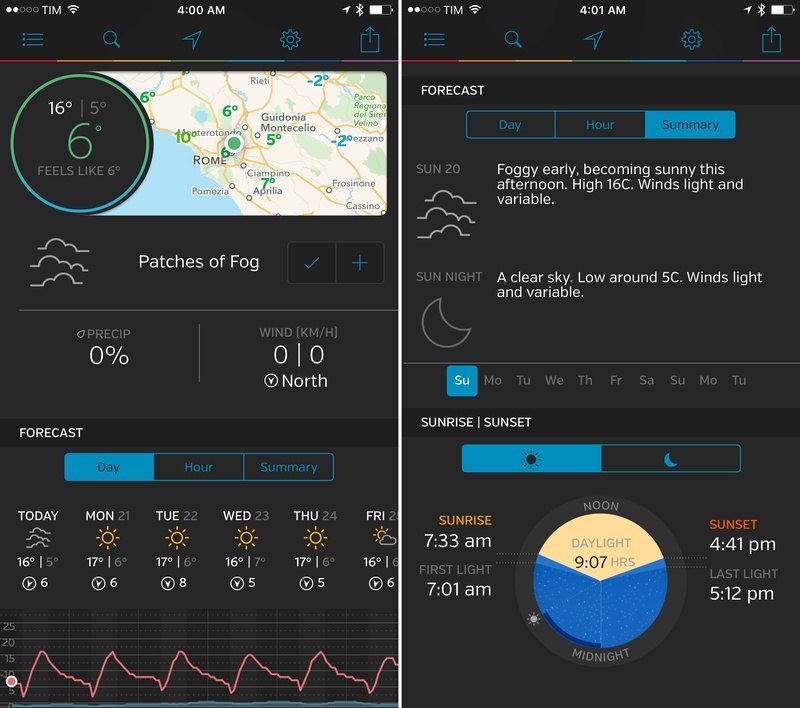 Another app that I use for one feature I can't have anywhere else: with Weather Underground, I can connect to the open source Netatmo weather station at the end of my street and check for precise weather conditions and other stats. This hyper-local weather reporting is superior to anything else I've tried over the years and it lets us keep an eye on humidity around us as well as temperature outside (as a backup for the Eve Weather sensor). It also helps that Weather Underground looks great and has terrific charts and visualizations. LongScreen. When I want to combine screenshots with pretty iOS device frames for featured images in my articles, I use LongScreen's merge feature. In addition to high-quality device frames, LongScreen can combine screenshots from different platforms in a single image – for example, you can put an Apple Watch next to an iPad Pro, or two iPhones next to an iPad. LongScreen can also be used to clean up status bars and interact with other apps via URL scheme. Pinnacle Studio Pro. As someone who always buys new iOS devices and is friends with a group of hip hop dancers, I've decided to help them shoot and edit videos of their choreographies to post online. The camera in the iPhone 6s Plus with optical image stabilization is more than capable of shooting what they want, and I've committed to take care of the process going forward. After researching all my options for editing video on iOS, I've settled with Pinnacle Studio Pro. 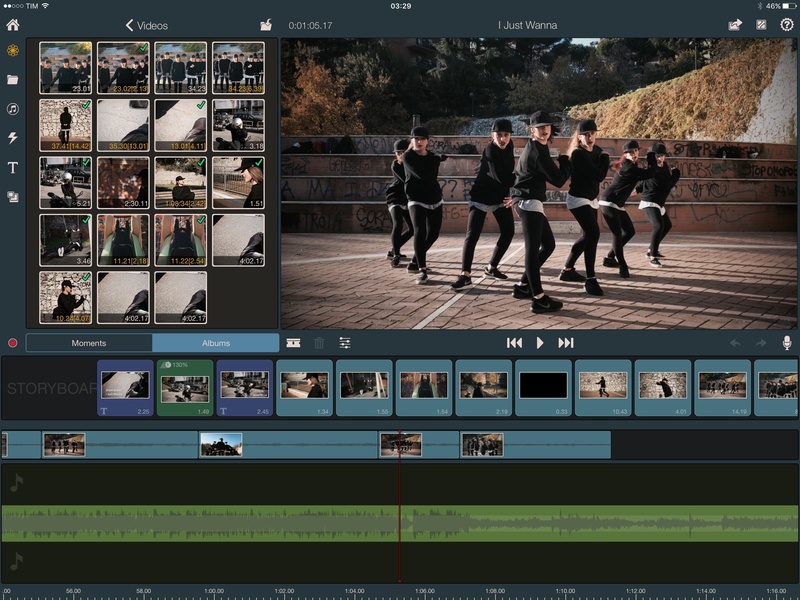 Based on the old Avid for iPad, Pinnacle is a video editing app with fewer features than a desktop editing suite but considerably more options than iMovie. Plus, I immediately understood Pinnacle's interface in a way that didn't happen with iMovie, which I found confusing and overly simplistic. Pinnacle on my iPad Pro was a able to handle 1080p video at 60fps with hundreds of edits and clips in a single timeline, and it exported the final product in less than a minute. There's a lot to unpack and master in Pinnacle, but this is the app I'm going to be using for the next projects. The first video is available here for those interested (and it may be blocked by YouTube on mobile devices). VideoGrade. After shooting multiple scenes with my iPhone and before importing everything into Pinnacle, I wanted to apply some basic color corrections to the video files to give them a grunge/underground feel that played well with the music. 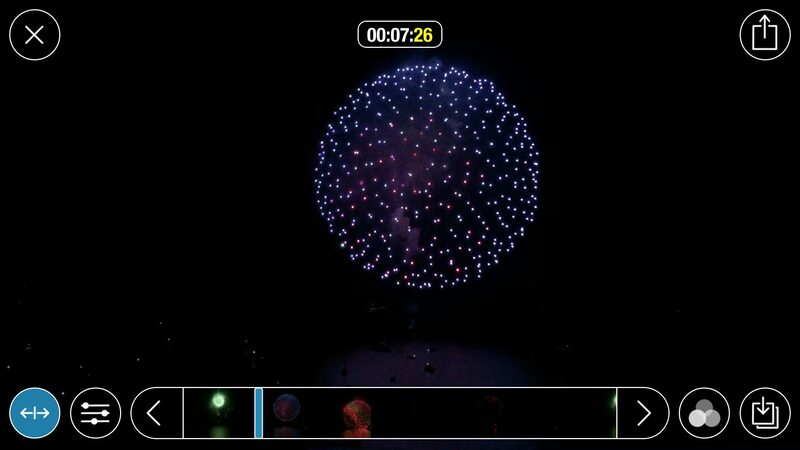 VideoGrade does this elegantly and with great performance on the iPad Pro: after importing a video, you can play around with a few sliders to tweak the appearance of the video, which is previewed above the controls. The UI is easy to use even for non-experts like me, and I was able to perform simple color grading consistently across a lot of clips. I'm also going to keep using this one in the future. Instanty. While editing, we (the girls and I) realized that we wanted to share some pictures from the videos on their social channels as teasers, but we didn't have any photos from the sessions because we hadn't thought about static material. Thankfully, I knew there were options to extract still frames from videos, and after buying about a dozen apps I picked Instanty. With this app, you can scrub through frames in a video with a slider or with arrows, pick one, apply some effects if you want to, and then export. The interface to do this makes sense, performance with 4K and 60 fps videos is great, and I haven't run into a single issue. Another nice discovery that I'm going to keep around for my hobbyist video editing side gig. The second half of my 2015 has been all about 2Do. 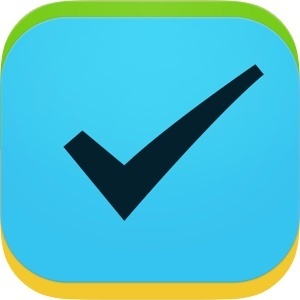 The app has been around for years, but Fahad Gilani's extremely customizable and powerful task manager deserves to rediscovered today if you haven't checked it out in a while. 2Do has played a fundamental role in helping me launching Club MacStories and my reviews of iOS 9 and the iPad Pro. I can't live without 2Do anymore, and I'm excited for its future. If you had told me two years ago that Microsoft would end up making the best email app for iOS, I would have probably called you crazy. This year, Microsoft not only showed good taste in acquisitions – it also proved capable of iterating quickly on Outlook, turning it into a fantastic email client with Dropbox and Google Drive integration, fast search, and calendar integration. 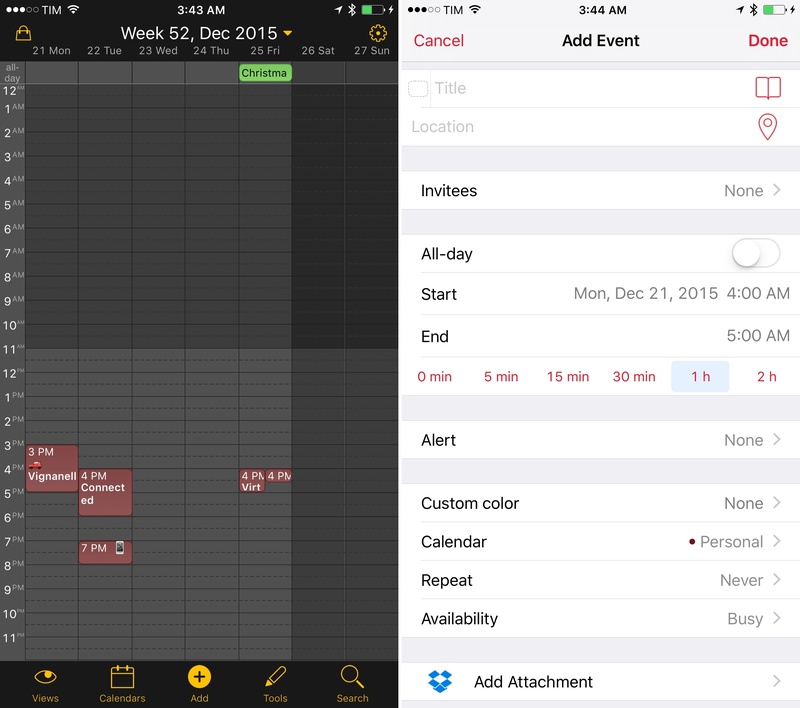 In many ways, Outlook for iOS epitomizes the new Microsoft. Tapbots' comeback with Tweetbot 4.0 this year has brought back the Twitter client for power users I've been waiting for. With an iPad app that truly takes advantage of the device's large display, faster iCloud sync, and support for new iOS technologies, Tweetbot 4.0 is my favorite Twitter app for iOS and a powerful way to interact with Twitter across multiple devices. With the help of Graham Spencer, I've put together some stats and interesting details about my must-have iOS apps as compared to previous years. 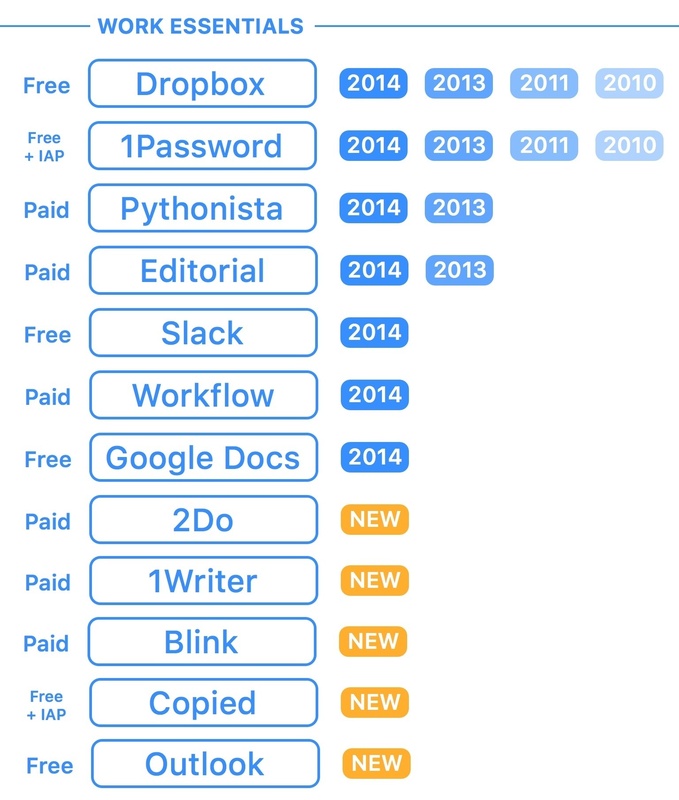 Out of 50 apps, 28 are free and 22 are paid apps. As of December 20, the total cost of paid apps is $122.78, with an average cost of $5.58 for paid app. 16 apps are completely free with no In-App Purchases or recurring subscriptions. 9 apps had In-App Purchases I bought to unlock full functionality, remove ads, or support the developer. Total cost of IAPs is $39.91. Combined, paid apps and IAPs make for a total cost of $162.69. Only one paid app offers an IAP for a "paymium" model – Pinnacle Studio Pro. 4 apps offer annual subscriptions to unlock extra functionality, remove ads, or support the developers (Overcast, Instapaper, Newsify, and Weather Underground). Total cost of annual subscriptions is $55.96/year, or $4.66/month. Only one app is based on a monthly subscription (Manything) for $6.99/month. Combined, paid apps, apps with IAPs, annual subscriptions, and one monthly subscription for 12 months cost me $302.53 in 2015, with an ideal cost of $0.83/day. Below, a graphical visualization of my must-have apps, organized by category and reported with the previous years they also appeared in. 9 apps were also must-haves in 2013; 21 were also must-haves in 2014; only Dropbox and 1Password have always been must-haves. 26 apps have never been must-haves before this year's list. Out of 50 apps, only 7 are not Universal apps: 6 for iPhone and 1 for iPad (Fantastical). The most notable difference in terms of apps is the consolidation of music and notes into default Apple apps with iOS 9's Apple Music and Notes. Both offer compelling advantages that have convinced me to start using them months ago (I'm on a family plan with Apple Music, too). It's also quite obvious to see how, since moving to iOS as my only computing platform (I don't really count OS X in this case, where I only use Safari, Skype, and QuickTime), the number of utilities has gone up, suggesting I'm using my iPhone and iPad for more tasks. Next year, the iPad Pro is going to remain my primary computer and I'll continue to use a big iPhone. I am, however, expecting fairly important changes from iOS 10.
iOS 9 added a new dimension to my iPad workflow this year. 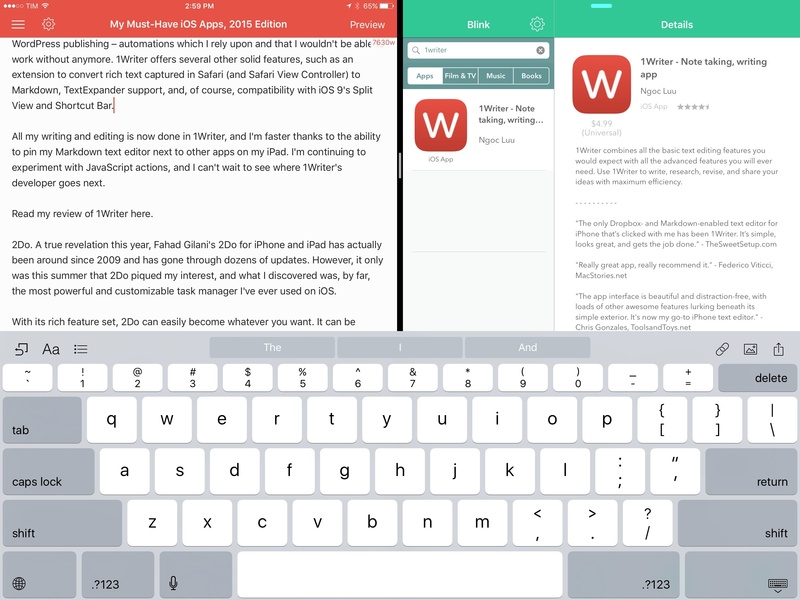 The apps I've found myself using the most – or switching to – are the ones that were updated for multitasking or an improved keyboard experience – essential traits of modern iOS productivity apps. My expectations have shifted: an iPad app no longer commands the screen, which has become a canvas for multiple apps at a time. It only makes sense for the next major version of iOS to keep following this path and enable deeper communication and interactions between apps displayed concurrently in multitasking. On the other hand, most of the apps I've mentioned in this list aren't iPad-specific apps anymore – they're Universal versions, often based on iPhone app designs adopted for the iPad's display. For many developers, the lack of incentives in pushing iPad-only experiences on the App Store has resulted in a trend of making iPhone apps first (or iPhone apps only) and then bringing a minimum viable port to the iPad at a later stage. As a customer, this is great – a single download gives me two apps. 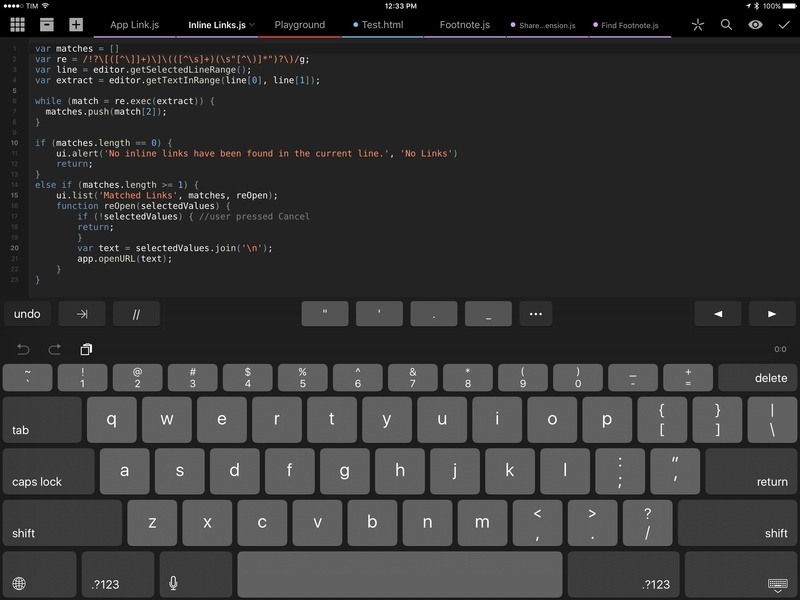 From a higher perspective, this could be troublesome for the future of the iPad platform. I don't want to see developers settling on unimaginative iPad conversions now that the iPad is starting to be a powerful, vibrant ecosystem again. 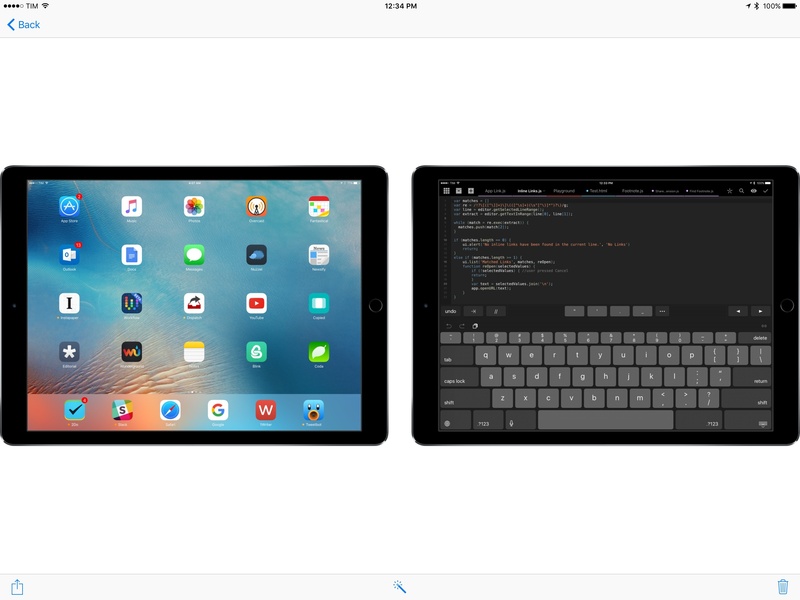 I genuinely believe that the iPad is the future of computing, and I hope the App Store can evolve to enable all kinds of developers to build that future. The apps I've used this year and collected in this article are proof of the App Store's richness and developers' creativity. It'll be interesting to observe how 2016 and the tenth version of iOS will affect the tools I use and how I work from my iPad and iPhone. As usual, let's check back in a year.